I was invited to the Social Innovation – Driving Force for Social Change (SI-DRIVE) final conference which took place earlier this week in Brussels. SI-DRIVE is a four-year project funded by the EU and launched in 2014. The project has undertaken comprehensive research on the topic. It has also managed to create a network of European social innovators as well as selected representatives from developing countries. 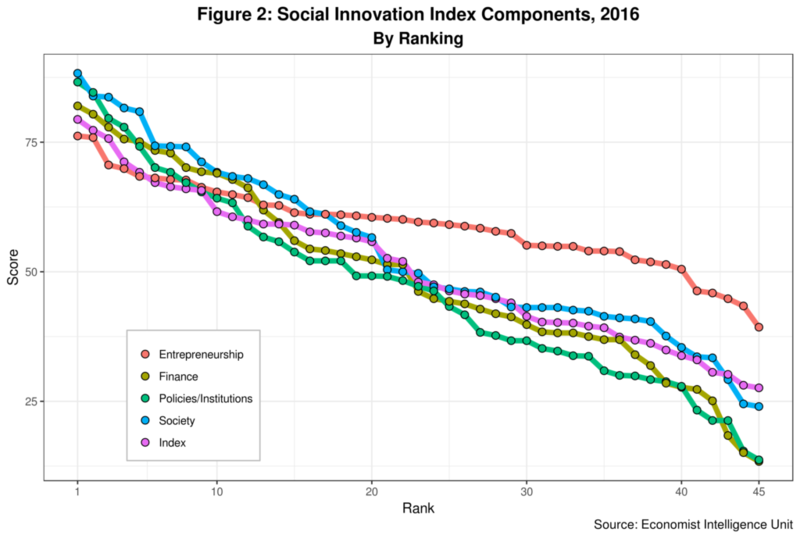 After a few years of closely following the topic, I must admit social innovation fell off my radar screen around 2015. Partly to blame are new technologies such as blockchains and the rebirth of older ones such as Artificial Intelligence (AI) – now propelled by machine learning. Both could be used to foster social innovation. But this is still in the works. 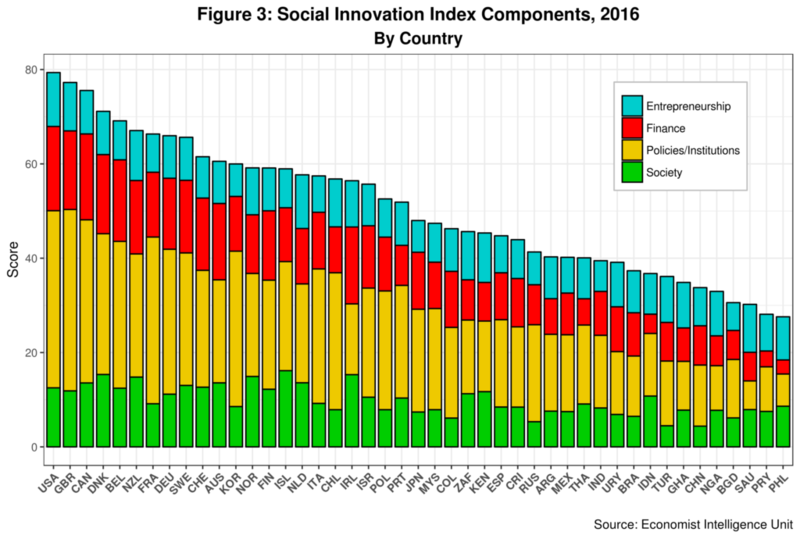 Social innovation has been around for over one hundred years, peaking at some specific historical junctures and then disappearing from the public eye. It seems to move in long waves of development. The latest wave appears to have started around 2005/2006, pushed in part by the emergence of social media and the global diffusion of mobile technologies.1 See https://ssir.org/articles/entry/rediscovering_social_innovation. Indeed, there is no one single definition of social innovation. The most common links new ideas and new solutions to social change, explicitly targeting persistent socio-economic and governance gaps.2 See for example TEPSIE 2012 and the SI-DRIVE 2017 report. Not that having a unique definition will make a big difference to practitioners on the ground. However, a social innovation index (SSI) has been developed by the Economist Intelligence Unit (EIU). The index comprises four parameters which are assigned different weights to calculate country scores. Unfortunately, the index only includes forty-five countries. Figure 1 presents the overall country rankings by income levels. Twenty-four countries in the sample are part of the developed world. 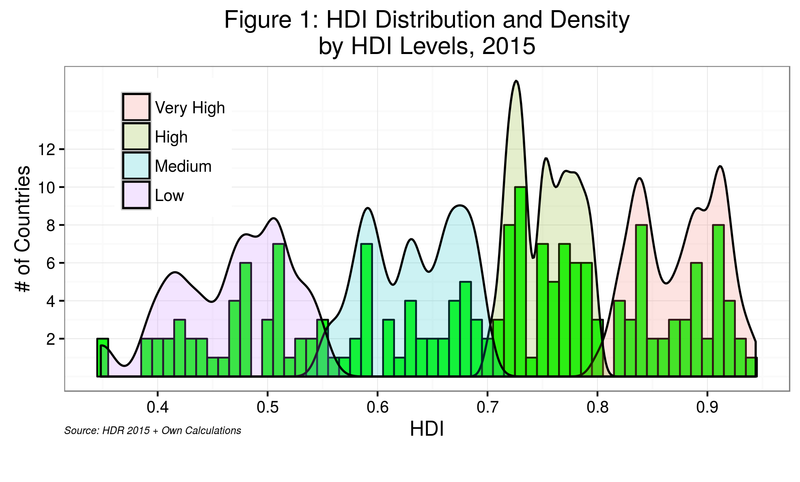 The data thus does not provide a reliable base to make any broad generalizations about developing countries. In any case, Spain is lagging when it comes to industrialized countries. And Malaysia, Colombia, South Africa and Kenya seem to be the bright stars of the Global South. 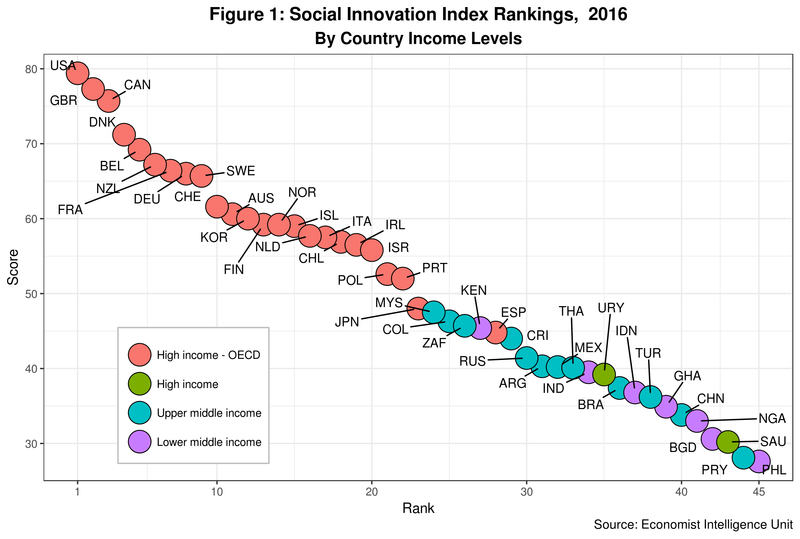 Evidently, country income levels and social innovation are strongly correlated. Figure 2 presents the four SSI components. EIU assigns the most weight to the Policies and Institutions component (44.4% ) and the least to Entrepreneurship (15%). Finance is second with 22.2 percent, while the Society component captures a mix of variables such as volunteerism, civil society engagement, and political participation among others. Note the peculiar pattern of the Entrepreneurship component which has the lowest dispersion of all, thus suggesting it is the most developed in all countries included in the sample. It is therefore possible to conclude, from a policy perspective and bearing in mind sample limitations, that developing countries need to focus much more on the other components to make further progress on social innovation. Figure 3 presents the SSI component share by country. As expected, the relative share of Entrepreneurship is more or less the same across most countries regardless of rank. On the other hand, Policy and Institutions are indeed highly and positively correlated to rank. Policy development to support social innovation was the primary focus of the Brussels meeting. My contribution centered on human development and international development agendas such as the UN Sustainable Development Goals (SDGs), spiced with a little bit of new technologies here and there. The SDGs are now universal and applicable to all countries. They also cover a wide range of issues with its 17 goals and over 160 targets. While not explicitly mentioning social innovation,3 But innovation in general is part of goal 9. the SDGs share a common goal: promoting social change. If anything, the SDGs should open policy space to social innovation practitioners, researchers, and decision-makers who support the area. Indeed, this is not sufficient. Perhaps more important is to link at the local level social innovation initiatives and projects to traditional development areas such poverty alleviation, democratic governance, conflict and crises, gender, etc. These areas are not only well-established but also run programmes and projects, some quite large, that could directly benefit from social innovation and have increased impact on the ground. Synergies here will make a considerable difference to stakeholders and beneficiaries, and improve human development in the medium term. Social innovation is not a goal itself. Instead, it should be seen as an enabler that can add real value if harnessed strategically. Another critical point related to the difference between public and private goods. At the Brussels meeting, the good old 1990s Grameen Village Phone initiative, which used the then-emerging mobile technologies to furnish microcredit to poor people in Bangladesh, was frequently cited as a classic example of social innovation. And rightly so. But the project was trying to close a gap related to a private good (or service) that the private sector had been unable to close.4 By the way, this is still the case today as two billion of people yet do not have access financial services. Private goods have a very different logic from public goods as they can by default generate revenue and profits. In the case of micro-credit, micro-lenders have to pay interest on loans that cover costs and includes revenue for the lender. Sustaining such initiatives is thus much more feasible as financial gains are embedded in the equation. This is not the case for public goods. This is a crucial distinction that social innovators should keep in mind when designing and implementing projects and initiatives. The other big elephant in the social innovation room is scalability. Looking back at the evolution of the Grameen initiative shows that the project did not scale in spite of concerted efforts, both nationally and internationally. The same can be said about Kenya’s M-Pesa which has undoubtedly been more successful. No doubt this is a complicated issue which, it must be said, is not exclusive to social innovation. As a matter of fact, most development projects have a hard time scaling up. This is not just a financial issue. In addition to cross-sectoral synergies, scalability will demand concerted efforts across actors and increased involvement and project ownership by local stakeholders, among others. In spite of my neglect, I am happy to report social innovation is indeed alive and kicking. It may still even be on the upswing in the latest long wave of development that has characterized it through the years. And new digital technologies might bring positive change to the area as long as we do not lose sight of the final objective: improve human development across the board. 2. ⇧ See for example TEPSIE 2012 and the SI-DRIVE 2017 report. 3. ⇧ But innovation in general is part of goal 9. 4. ⇧ By the way, this is still the case today as two billion of people yet do not have access financial services.